Express Montage Adhesive is a single component, fast curing polyurathane based adhesive It combines high bond strength with fast curing. It’s used to bond almost all common building materials. Exteremely high bond strength on numerous substrates. Excellent resitance to moisture and weather conditions. 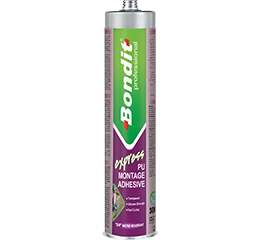 It is suitable for use in construction and repair applications where a permanent strong bond is required between porous-porous and porous-nonporous surfaces. It can be used for bonding to various kinds of construction materials such as wood, MDF, concrete, metal, polystyrene and polyurethane foam, PVC, marble, granite, polycarbonate, glass and ceramic etc.